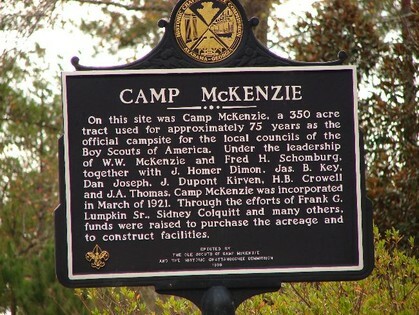 A portion of the lands that make up Callaway Woods was previously used by the Boys Scouts of America, Columbus Council dating to 1923.The camp was known as Camp McKenzie. In 1925, the name of Columbus Council was changed to Chattahoochee Council of BSA which continued to use the property until it was acquired by Cason J. Callaway for the development of Callaway Woods. Mr. Callaway sold his interest in the property to the George C Woodruff Company and the W.C. Bradley Company who continued to develop it. That development was completed in 2007. Another portion of the property originally belonged to Mr. Doug Mobley, for whom the lake is named. In 1938, Mr. Mobley built a lodge, which still stands today and 44 acre lake on lands presently known as Lakeside. The Boy Scouts used the old Mobley Lodge up until the time they relocated to new facilities on West Point Lake. The 480 acre tract that makes up Callaway Woods is rich in natural resources and offers many amenities to it's owner-members. While walking on the walking trails next to Lake Mobley it is not uncommon to see deer, wild turkey, or other aquatic animals like otter, beaver or muskrat. The lake also supports a population of Canadian Geese and mallard ducks. Occasionally, bald eagles can be seen in the winter months along with flocks of migratory waterfowl. There is a swimming pool and pavilion available to owner-members for parties and entertaining as well as general daytime use. When private parties are scheduled by reservation they are noted on the community calendar.